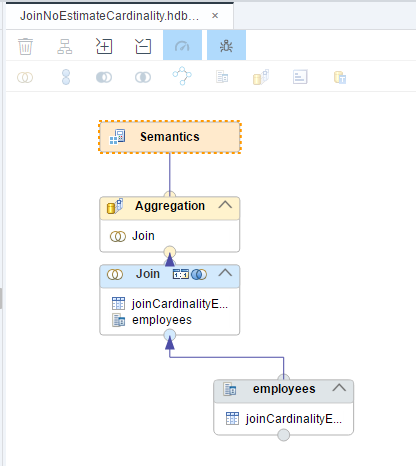 This example is referenced in my other post about the usage of the join cardinality settings in SAP HANA Calculation Views. Please have a look at the other post to get a better understanding of the context for this example. 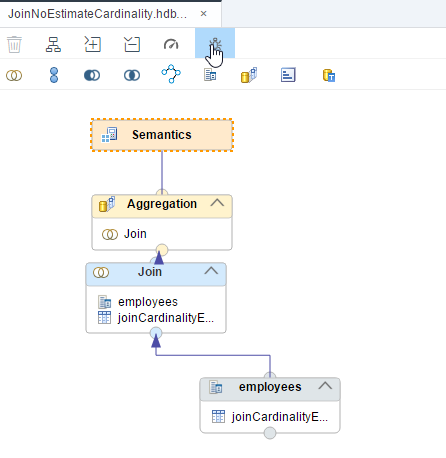 The following examples will demonstrate how setting join cardinality in Calculation View joins can lead to join pruning and thus better performance. Manually set the cardinality of the previous view developed here to “1..1” and route through all fields so you can build the view. Make sure that field “employee_1” is indeed coming from the left table. If this is not the case (e.g., because you build the model in a slightly different way) change the column mapping in the join node so that “employee_1” refers only to the left table. Start debugging by selecting node “Semantics” and pressing the debug button. Based on the greyed-out objects you can conclude that indeed “employees” was pruned away. c) the cardinality was set so that no increase in number of records would be expected by executing the join. Looking at the result of running the debug query shows that “employees” is not greyed out meaning that it was not pruned. You will see that pruning only occurs with left-outer join and “n..1” (or “1..1” from before). As discussed above, inner joins will prevent pruning. One final example in this section will show the influence of the type of requested measures: In the examples before join pruning only worked when there was an outer-join setting and the to-be-pruned table had a cardinality of “..1”. If you only request a count distinct measure in this example also a cardinalty of “n..m” will allow pruning to occur. The reason is that count distinct will remove any potential duplicates and the outer join will gurantee that no records are lost. In sum, as no records can be lost due to the outer join and potential duplicate records do not influence the outcome of count distinct measures, executing the join does not influence the value of the measure. Therefore, the join can be omitted if no fields are requested from the to-be-pruned table. What holds for count distinct measures also holds if no measures are requested by the query: Obviously, if no measures are requested by the query also no impact of joining on the non-requested measures is expected and join pruning can occur. As you can see no join pruning occurs and both tables are used. If you are unsure about the authorizations needed to run EXPLAIN PLAN in SAP HANA Studio on HDI-container objects and you are in a test environment you could simply add the access_role of your container (JOINCARDINALITY_1 in the current example) to your Studio user. The downside of this quick and dirty approach is that it assigns too many additional privileges that are contained in the role. Assigning too many privileges is something you probably want to avoid in a real scenario.